Hello, I have a 4 month old leopard gecko. After it sheds, it scratches its head and back on anything it can in it's tank until she bleeds. I took her to the vet who said to put neosporin on her. He basically didnt help and she keeps doing it. It's getting worse. Have you ever heard of this? She has a moist hide and a warming mat. 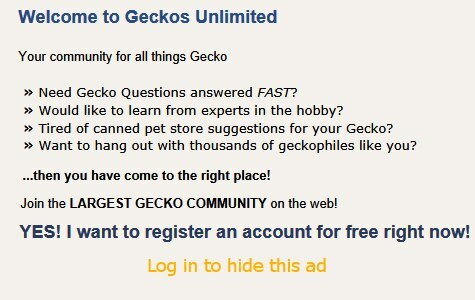 A warm welcome to Geckos Unlimited, Colleen! Until we get this problem sorted out, is it possible to remove the rough objects in the enclosure? Does your leo have a warm moist hide to help her while she sheds? In the meantime does your neosporin contain "pain relief"? If so, many vets believe that's not good for reptile skin. Can your vet prescribe silver sulfadiazine cream instead? Thanks for writing back. Yes, I have taken out any rough items. She has a moist hide and a warming pad. The vet did not have any answers - that's why I tried here to see if anyone with more experience would know. The neosporin does not have any pain reliever in it. You're welcome. I've never heard of a leo doing this either. Is her skin beginning to heal when you use pain-reliever free neosporin? The location of her moist hide is important. Where is yours placed? There's a lot of inaccurate info floating around the internet. Last edited by Elizabeth Freer; 04-14-2019 at 06:19 AM. Similar thing happened to my gecko where he had circulation cut off from his tail during a bad shed. I took him to the vet, who told me his tail tip would fall off and may grow back. He also gave me antibiotic in case an infection occured.